Today I've been doing a little clean-up in my craft room. I need to focus this week on my daughters wedding preparations, so card making will need to be placed on hold. Picking up the pieces and scraps have resulted in this card I want to share today. 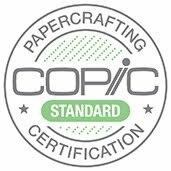 I used an embossing folder from Crafters Companion and applies some Distress Ink. Picking up some various die-cut leaves and gold accents for a finished card. Sorry I've been away for awhile, but it's a little busy around here. The local scrapbook store where I teach, hosted a large crop last week, I've been working on my daughters wedding decor and I did some MAJOR canning this week. Now we have a birthday party today, which will be a nice break. I worked on some Salad Spinner backgrounds last weekend and I needed a masculine birthday card today. Its so nice to have these backgrounds on hand where I can just add a sentiment. So simple, but major impact. I hope you have a super weekend and thanks for stopping by. I have a new watercolor class next month at Scrapmania in Cedar Rapids, Iowa and I have been playing with a few variations. Of course I will do some basic watercolor using the Zig Clean Color Real Brush Marker along with the Nuvo Aqua Flow Markers. I used the Nuvo markers for the card below and found them very easy to use and very comparable with the Zigs. I just love this large Tiger Lily image from Power Poppy. At this time this card will not be a part of my class, but may be offered at a later date. So I'm sharing today the tags I made for my Daughters Wedding. We are on a 30 day countdown now and my deadline is near. I have a fabulous Daughter that is very organized, but I do feel bad that I live so far away from her and I haven't been able to be with her during this fun time. She waited a long time to find the perfect guy, (which was worth her wait) so we can't wait to share her special day. I'm working on table decorations, boutonnieres, special labeling tags and these ring tags for the napkin-silverware package. I stamped the sentiment on 200 tags and now have to tie the twine on them. I just wanted to share whats going on in my craft room lately. Todays card features a new die set from Avery Elle. Using one of my card fronts created with my spinner technique, I cut the die from a neutral cardstock. 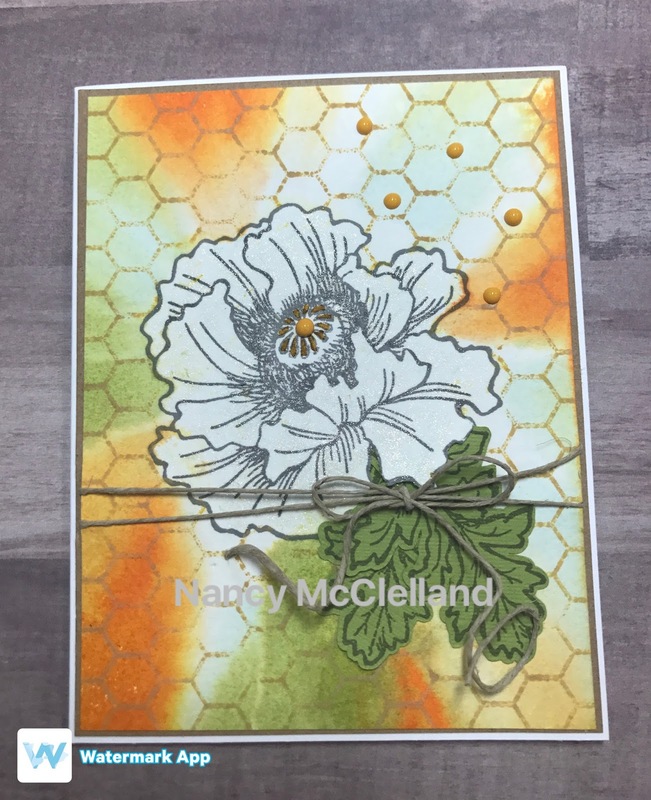 Adding an accent strip of green and coordinating leaf from Stampendous Pretty Poppies. The sentiment die is included in the set so I cut four layers and stacked them on top of each other, gluing each layer. By doing this I was able to achieve the chip board effect. I finished the card with a button and twine. Today I had some time and wanted to try another project using my Salad Spinner. Thinking about options of how the background could be used, I thought about stamping an image and masking it before I starting adding color in the spinner. Of course I needed to use a liquid mask instead of a paper mask because of all the water I will be spraying. Here is my card and video of the finished project. I had so many questions about how I used my Salad Spinner to make my Spin Art style cards, as promised I made a short video to show you my process. Here's my card using the background I made during the video. Is that a 'Salad Spinner'???? Yes that is what you are seeing. I will be honest I don't recall where I got the idea that I wanted to do 'Spin Art' with my re-inkers. So I started the quest today to find one of those 'spin art' things in the toy section of my local big store. Now you must understand that my husband supports everything I try and while we were walking through the store having no luck, we started talking about things that spin to achieve what I wanted to try. I didn't want to spend more than $10.00 just to try something that I dreamed up in my head. Anyone relate? "what about a salad spinner"? What did I say..... THAT'S A FABULOUS IDEA! So off we headed back to housewares to pick up this $9.00 item and head to the checkout. 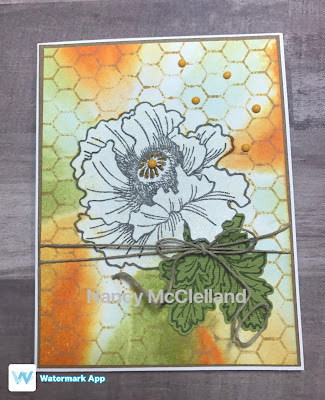 This second card I used a combination of Distress and Distress Oxide re-inkers. Playing with some water drops from a spray bottle helped add some more interest, finally I used a Circle Dot Stamp to add the inked dots. Sequins, Water Droplet Gems and shinny sentiments finish thing off. I hope you enjoy these cards and don't think Im crazy.